Y Takeda, S Arai. Relationship Between Vertebral Deformities And Allergic Diseases. The Internet Journal of Orthopedic Surgery. 2003 Volume 2 Number 1. Background: A research verification between visceral disease and immune dysfunction from sympathetic segmental disturbances secondary to vertebral deformities has been put forward by chiropractic and various fields' medical practitioners. We report on the positive results of a controlled study using vertebral correction treatment to reduce vertebral misalignments in patients with atopic dermatitis and bronchial asthma. We also discuss possible mechanisms for the relationship between visceral and immune dysfunction and vertebral deformities. Methods: We divided 360 atopic dermatitis patients into six groups in the treatment frequency to compare a treatment effect. We investigated the existence of the diurnal secretion quantity change of adrenal cortex hormone to judge the present condition of the adrenal cortex functions of 1,699 atopic dermatitis patients and bronchial asthma patients. We investigated the spinal condition of 1,028 atopic dermatitis patients and bronchial asthma patients to consider the relationship between the allergic disease and the spinal misalignments. We implemented Takeda Method to 906 bronchial asthma patients and 1,827 atopic dermatitis patients and chased the treatment effect. Results: Among 120 atopic dermatitis patients who received spinal correction treatments every day, 106 showed improvement in skin itching and 86 showed improvement in skin condition. Among 240 atopic dermatitis patients who did not receive spinal correction treatments every day, we could not obtain a sure treatment effect. As a result of the questioning about the diurnal quantity change of adrenal cortex hormone secretion to 1,699 patients, the adrenal cortex function of these patients may be in the decline condition. We obtained over 70 percent improvement in allergic symptoms by Takeda's Method. We found that vertebral misalignment is a common and characteristic finding in patients with atopic dermatitis and bronchial asthma. Conclusion: According to the results of this study the possibility may be considered that chronic nerve compression secondary to vertebral deformity in the thoracic region had a significant effect on the immune function of atopic dermatitis and bronchial asthma patients. The adrenal cortex functions of these allergy patients may be in the chronic decline condition with this chronic nerve compression. A sure treatment effect cannot be obtained without considering the nature and the function of the autonomous nerves.
? We have to investigate the relationship between allergic diseases and thoracic vertebral misalignment which is caused by chronic minor spinal curvature disappearance (SCD). This study on allergic disease has its origin in the observation that of 3,013 patients with atopic dermatitis (AD), bronchial asthma (BA), pollinosis, hay fever, allergic coryza, etc., a high ratio also had chronic vertebral misalignments. As result of a treatment that involved vertebral correction treatment directed at improving spinal misalignment, misalignment and loss of curvature of 2,733 allergic disease patients who concurrently suffered from AD and BA, it was shown that the allergy symptoms, such as skin eczema, skin itches, and asthma attack improved along with the reduction of chronic vertebral misalignment (CVM). As the result of a follow-up study of these 2,733 patients, it was found that the CVM improved toward normal. As it was surmised that allergies, such as very severe AD and BA, have a strong connection to severe CVM, a multi-faced comparative study and detailed analysis was continued on patients with allergies and SCD. Out of 3,013 allergy patients a detailed multi-faceted comparative study of 2,733 allergy patients who also had abnormal SCD was conducted. The analysis of the study results showed that particular characteristics were shared by AD patients and BA patients. It was found that CVM was present in both AD patients and BA patients. Changes in vertebrae caused by CVM were present in particular regions of the spine and chronic narrowing of the vertebral foraminae due to the changes in the vertebrae were present. 3. The presence of a chronic negative feedback related to the adrenal glands based on intracerebral stimuli. 4. The presence of a chronic norepinephrine cycle dysfunction related to the adrenal glands based on intracerebral stimuli. 6. The presence of a chronic dysfunction of the adrenal glands and adrenal cortex themselves caused by blood circulation dysfunction in the adrenal glands. 7. The presence of chronic various backache. 8. The presence of a restraint at the cellular and molecular level to the translation and transcription for the production of cytokine. Note: Atopic dermatitis and bronchial asthma patients with severe symptoms have suffered from very frequent itches and asthma attacks. In order to alleviate these severe conditions, these patients have dealt with the particular disease symptoms with medicines such as adrenocorticoid hormone drugs, antihistamines, and immunosuppressants. When exposed to antigens above the limit of the patient's immunity while chronic, abnormal conditions continue to be present, it may be considered that allergic symptoms appear in a more conspicuous form. 19 This is especially true in patients whose adrenal cortex secretions are temporarily declining due to long-term use of adrenocorticoid hormone drugs, and as a result various allergic symptoms may appear in more severe forms. It may be considered that damage by further abnormal allergic reaction in the innervation organ that is being continuously and severely impacted by chronic neurotripsy in the intervertebral foraminae due to the changes in the vertebrae caused by the CVM, will appear as more serious symptoms.33, It appears most likely that this is the great difference between patients with mild symptoms and patients with severe symptoms. It can be said that the fundamental treatment of these diseases is the improvement of the chronic narrowing of the intervertebral foramina secondary to vertebral distortion, along with the alleviation and restraint of inflammation, allergic reactions by particular medical treatment, and the improvement of the dysfunction of the adrenal glands, adrenal cortex, and trachea which are innervated organs. The number of the atopic dermatitis patients among the 3,013 allergic disease patients. 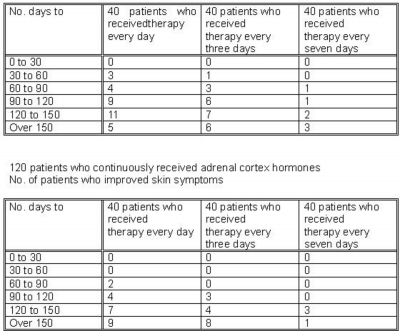 The number of the atopic dermatitis patients who continuously received adrenal cortex hormones. b. 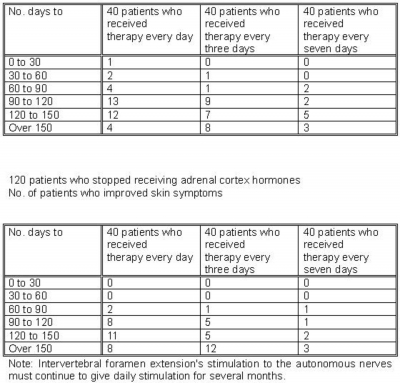 The number of the atopic dermatitis patients who stopped receiving adrenal cortex hormones. c. The number of the atopic dermatitis patients who did not receive adrenal cortex hormones. We executed vertebral correction therapy on these allergic disease patients with CVM and changes in vertebrae and compared the changes in symptoms. We chose 40 patients randomly as our comparative study object from each section. Note: These patients were over 16 years old, suffering from atopic dermatitis over 5 years. a. 40 patients who received thoracic vertebral correction therapy every day. b. 40 patients who received thoracic vertebral correction therapy every three days. c. 40 patients who received thoracic vertebral correction therapy every seven days. 1-b. The atopic dermatitis patients who stopped receiving adrenal cortex hormones. 1-c. 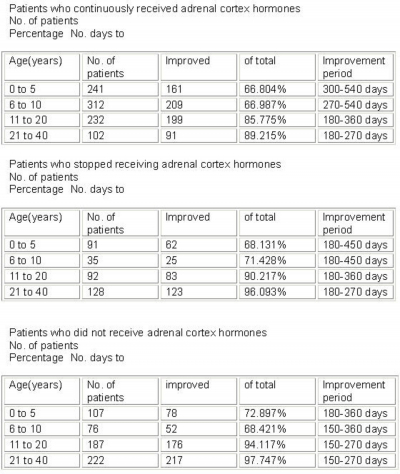 The atopic dermatitis patients who did not receive adrenal cortex hormones. 2. The number of the bronchial asthma patients among the 3,013 allergic disease patients. a. The number of bronchial asthma patients with severe symptoms. b. The number of bronchial asthma patients with comparatively mild symptoms. 3. The spinal column X-ray (and palpation of the spine) of atopic dermatitis patients and bronchial asthma patients. 4. Assessment of the muscles supporting the spinal column in allergic disease patients. The study investigation about the existence of the spinal curvature disappearance of the allergic disease patients. This is a method to correct changes in vertebrae due to vertebral distortion and to improve the chronic narrowing of the intervertebral foraminae. It was developed within one year starting in 1994 at the University of Tokai, Graduate School of Engineering, Department of Human Engineering, with the objective of executing the correction of the changes in the vertebrae more safely and reliably. This method was developed based on various comparative experiments. Note: This method differs from the traditional orthopedic method in that it requires a treatment technique that incorporates 9 physical elements in order to safely and reliably correct the patient's posture during treatment along with correction of the targeted vertebrae. Also, to attain the best effect from this technique, maximum pleural pressure and abdominal cavity pressure was applied. Regarding the frequency and duration of the treatment to correct changes in the vertebrae caused by vertebral misalignment, it is noted that the results of comparative studies on AD patients and BA patients showed that daily corrective treatment for three to six months of the course of treatment had the best improvement effect. In the analysis of the follow-up observations of the effects of the Takeda Method on the changes in vertebrae caused by vertebral distortion present in allergic disease patients, the detailed analysis of patient's IgE counts and eosinophil counts was necessary and useful for the comprehension of the direct and indirect changing process of the symptoms of the disease. We considered that the eosinophil counts were an effective means to assess the severity of the patient's inflammation and the direct and indirect changes of their inflammation condition. These values provided important indirect information regarding the conditions of recovery of the patient's adrenocorticoid hormone secretion function and the conditions of recovery of functions in the inflammation region and its surroundings. These values were also a useful means to directly and indirectly assess the presence of the patient's inflammation, severity of inflammation, presence and severity of abnormal immune reaction. Furthermore, we considered that these values might be used as a reference index to judge whether the patient's basic physical strength that is needed for recovery from the disease has improved. 1. Total allergic disease patients who have atopic dermatitis: 1,827.
a. 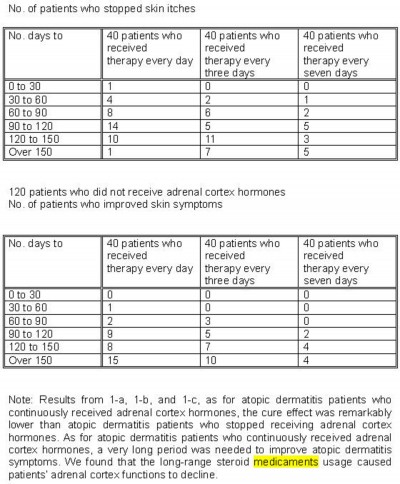 Patients with atopic dermatitis who continuously received adrenal cortex hormones: 887.
c. Patients with atopic dermatitis who did not receive adrenal cortex hormones: 594. Results of the detailed analysis of 1,827 patients who have atopic dermatitis and in which changes in vertebrae caused by vertebral misalignment are present, and their symptoms. Various atopic dermatitis disease symptoms of 887 AD patients who received adrenal cortex hormones with chronic changes caused by CVM from the 8th to the 10th thoracic vertebra were comparatively severe. The atopic dermatitis symptoms of 346 patients who stopped receiving adrenal cortex hormones with changes in the 8th to the 10th thoracic vertebra caused by CVM were relatively severe. Various atopic dermatitis symptoms of 594 atopic dermatitis patients who did not receive adrenal cortex hormones with chronic changes caused by CVM from the 8th to the 10th thoracic vertebra were relatively mild. 2. Total allergic disease patients who have bronchial asthma: 906.
b. Patients with comparatively mild symptom bronchial asthma: 515. Note: Details on other allergic disease patients. a. Patients with allergic coryza, food allergy etc. : 412. Results of the detailed analysis of 906 bronchial asthma patients and in which changes in vertebrae caused by CVM are present, and their symptoms. The bronchial asthma symptoms in 515 bronchial asthma patients with minor changes in the 2nd to the 4th thoracic vertebra caused by CVM were comparatively mild. The bronchial asthma symptoms in 391 bronchial asthma patients with severe changes in the 2nd to the 4th thoracic vertebra caused by CVM were severe and unpredictable. X-ray of the patients, thoracic vertebrae showed that intervertebral foramina between the 8th and 10the vertebrae were much narrower than those between the other vertebrae, even taking into account differences in human size. 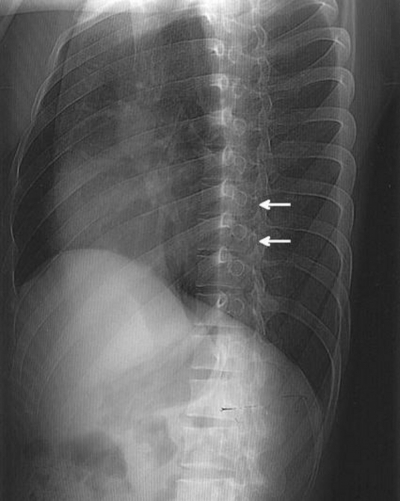 The curvature of the spine of this patient is scarcer than normal spinal curvature. In all the patients, there was disappearance of the posterior curve of the spine that peaks at the 7th thoracic vertebrae. The slight shift in thoracic vertebrae 8th to 10th causes narrowing of the vertebral foramina conduit for nerves related to adrenal cortex function. As for these vertebral displacement and abnormal spinal curvature, the existence of abnormal state can be clearly judged by palpating actually. The changes of the vertebrae from the 8th to the 10th thoracic vertebra caused by the abnormal spinal curvature are associated with the vertebral misalignment of the normal S-shaped spinal curve to the outer top of the 7th thoracic vertebra. 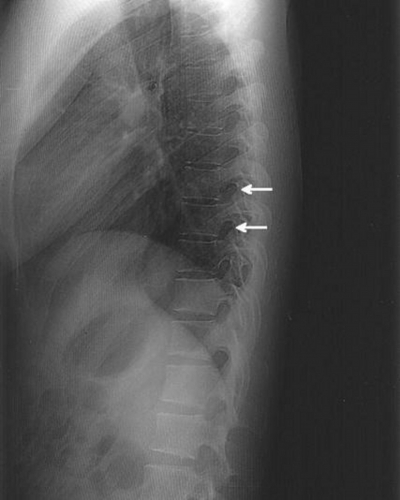 The changes of the vertebrae caused by this abnormal misalignment can cause multiple changes in the vertebrae that influence not only the forward and downward direction of the vertebrae along an axis either to the left or the right, but also a change in the vertebrae in a downward direction, depending on the condition of the vertebral misalignment. The changes in the vertebrae caused by the vertebral misalignment are present from the 7th or 8th thoracic vertebra to the 10th thoracic vertebra. On the changed vertebrae, changes in forward and downward direction are present, and sometimes this was influenced by changes in the vertebrae in downward direction. The vertebrae that are changed in forward and downward direction move in that direction and as a result, the inclination of the vertebrae is realized in the same direction. When the intervertebral disk is compressed forward and downward by changes in the vertebra, further downward pressure will thin the front area of the disk. The direction of the spinous process becomes horizontal due to the inclination of the front side of the vertebra in a downward direction. The upper articulating process that is causing the changes in the vertebrae is pushed forward and can penetrate the intervertebral foramina in the upper part of the changed vertebra. The thinner the front area of the intervertebral discs become and the thinner the intervertebral discs as a whole become, the further incline the vertebrae that support them in a forward direction and alter the downward direction. Note: These vertebral misalignments were the same condition of the 2nd to the 4th thoracic vertebral displacement which existed at the bronchial asthma patients. 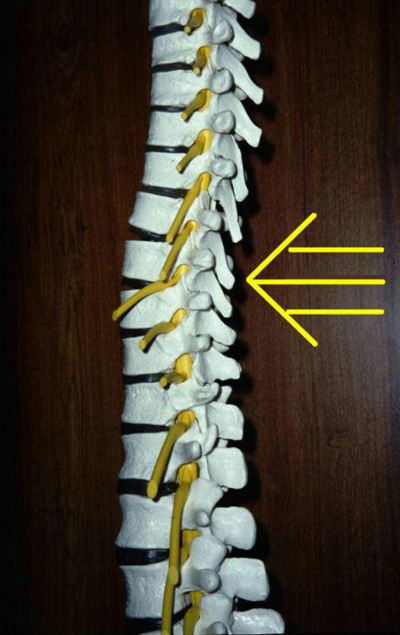 Figure 3: Spine model: The nerve compression in the intervertebral foramen which accompanies thoracic vertebrae deformities. This study is a detailed multi-faceted comparative study to prove a link between the vertebral deformities and the allergy. As a result of the spinal cord investigation of 1,028 allergy patients among 3013, we confirmed that over 98 percent of allergy patients had the vertebral misalignment. We found that these vertebral misalignments, their location in the spine, and the changes in the vertebrae were remarkably similar. Because the abnormality of the spine existed conspicuously only in the thoracic vertebra region, we consider that the innervation organ at this vertebral misalignment location was adrenal glands. Therefore, we implemented detailed questioning investigation about the existence of diurnal change of the adrenal cortex secretion quantity to these allergy patients to judge the present condition of these patients' adrenal cortex functions. As a result of the questioning investigation, we could judge that the adrenal cortex secretion function of these patients was in the slightly declining condition. We thought that the relationship between the vertebral misalignment and the adrenal cortex functions could be confirmed if the correction of the vertebral misalignment could improve allergic symptoms. We investigated the change of the symptoms while we corrected vertebral misalignments. We thought that the correction of misalignment was to give indirect stimulation to the autonomous nerves. On the occasion of correction of vertebral misalignment, we must consider the nature and the functions of the autonomous nerves. Then, we tried the comparative investigation of the treatment effect by the treatment frequency to the vertebral misalignment. It was necessary to give daily stimulation in the continuation for at least three to six months to the autonomous nerves indirectly to obtain sure treatment effect. As a result of this multi-faceted study investigation, we re-confirmed that these vertebral deformities and the allergic diseases linked together strongly.? Assessment of the muscles supporting the spinal column in allergic disease patients. Note: It is considered that improvement of the vertebral misalignment is the effective realization of the normal S-shaped spinal curvature with the 7th thoracic vertebra being the outermost vertebra on the curve, and that realization and maintenance of the normal spinal curvature is achieved by improvement and strengthening of the muscles that support the rachis. Based on the test results, we can state that the only treatment that can demonstrate fundamental effects on allergies such as atopic dermatitis, bronchial asthma, and pollinosis will have the potential to treat spinal curvature disappearance. In other words, we can state that a treatment that cannot fundamentally treat spinal problems cannot fundamentally improve conditions such as atopic dermatitis, bronchial asthma, pollinosis, and allergic coryza. Table 5: The questioning results about the skin itches to 1,008 atopic dermatitis patients. Table 6: The questioning results about the asthma attacks to 581 bronchial asthma patients. As a result of the questioning investigation, it wasn't sufficient but the quantity of diurnal adrenal cortex secretion's change existed at atopic dermatitis patients and bronchial asthma patients. As a result of this investigation, it is possible to consider that the adrenal cortex secretion's function of these patients is declining slightly. We are able to obtain significant alleviation of these diseases by improvement of the neurotripsy caused by the chronically narrowed intervertebral foraminae from the 8th to the 10th thoracic vertebra. This is the innervation region relating to the adrenal glands and adrenal cortex impacted by changes in the vertebrae caused by vertebral misalignment in the thoracic region. This was commonly present in allergic disease patients. There is a high possibility that allergic disease relates to the innervation of organs that relate to the immune function which are affected by changes in the vertebrae caused by the chronic vertebral misalignment. There is a high possibility that a preventive effect and significant reduction of the improvement period can be obtained by reinforcing and improving the muscles supporting the rachis. There is high possibility that the adrenal cortex secretion's function of allergic diseases patients is declining slightly. There is an expectation of alleviation, and prevention of development of symptoms by correcting the changes in the vertebrae caused by chronic vertebral misalignment, which is common in allergic disease patients. There is an expectation of reduction of the improvement period, prevention of the disease, reduction of side effects of drugs by using a treatment that combines the Takeda Method with traditional medical treatment. 1. Rec#140. Winsor, H. Sympathetic segmental disturbances-2. The evidence of the association, in dissected cadavers, of visceral disease with vertebral deformities of the same sympathetic segments.The Medical Times, November 1921: 267-71. Rec#367. Winsor, H. The prevalence of minor Curvatures and Deformities of the Spine in Man. Also in other Vertebrates. (Sympathetic Segmental Disturbances 1) The MedicalTimes. Oct. 1921: 237-9. 2. Schmorl and Junghanns, The Human Spine in Health and Disease,2nd American Edition, 1971, Grune and Statton, New York and London,221. 3. Buijs RM, Wortel J, Van Heerikhuize JJ, Feenstra MG, Ter Horst GJ, Romijin HJ, Kalsbeek A. Anatomical and functional demonstration of a multisynaptic suprachiasmatic nucleus adrenal(cortex) pathway. Eur J Neurosci. 1999 May, 11(5):1535-44. 4. Edwards AV, Jones CT, Bloom SR. Reduced adrenal cortical sensitivity to ACTH in lambs with splanchnic nerves. J Endocrinol. 1986 Jul;110(1):81-5. 5. Kesse WK, Parker TL, Coupland RE. The innervation of the adrenal gland.1.The source of pre-and postganglionic nerve fibres to the rat adrenal gland. 6. England WC. Functional innervation of the adrenal cortex by the splanchnic nerve. Horm Metab Res. 1998 Jun;30(6-7):311-4. 7. Campagnolo DI, Bartlett JA, Chatterton R Jr, Keller SE. Adrenal and pituitary hormone patterns after spinal cord injury. Am J Phys Med Rehabil. 1999 Jul-Aug;78(4):361-6. 9. De Nicola AF, Regulation of gene expression by corticoid hormones in the brain and spinal cord. J Sterois Biochem Mol Biol. 1998 Apr, 65(1-6):253-72. 10. Kovalovsky D, The Th1 and Th2 cytokines IFN-gamma and IL-4 antagonize the inhibition of monocyte IL-1 receptor antagonist by glucocorticoids: involvement of IL-1. Eur J Immunol. 1998 Jul;28(7):2075-85. 11. Crocker IC, Glucocorticosteroids inhibit leikotriene production. Ann Allergy Asthma Immunol. 1997 May;78(5):497-505. 12. Rocz Akad Med Bialymst 1999;44:17-23 The gastrointestinal mast cell in health and disease. Sulik A,Kemona A, Sulik M, Oldak E Pediatric Infectious Diseases Clinic, Medical Academy of Bialystok. 13. Norbiato G, Glucocorticoids and Th-1, Th-2 type cytokines in rheumatoid arthritis, osteoarthritis, asthma, atopic dermatitis and AIDS. Clin Exp Rheumatol. 1997 May-Jun;15(3):315-23. 14. Cidlowski JA, The biochemistry and molecular biology of glucocorticoid-induced apoptosis in the immune system. Recent Prog Horm Res. 1996;51:457-90; discussion 490-1. 15. Romagnani S. Th1/Th2 cells. Inflamm Bowel Dis. 1999 Nov;5(4);285-94. 16. Lorrentz A, Human intestinal mast cells produce IL-5 in vitro upon IgE receptor cross-linking and in vivo in the course of intestinal inflammatory disease. Eur J Immunol. 1999 May;29(5);1496-503. 17. Winterkamp S, Raithel M, Hahn EG Secretion and tissue content of eosinophil cationic protein in CD. Department of Medicine I, University of Erlangen-Nuremberg, Germany. Digestion 2000;61(1);68-76. 18. Cruse JM, et al. Facilitation of immune function, healing of pressure ulcers, and nutritional status in spinal cord injury patients. Exp Mol Pathol. 2000 Feb:68(1);38-54. 19. Terzolo M, et al. Growth hormone (GH) responses to GH-releasing hormone alone or combined with arginine in patients with adrenal incidentaloma; evidence for enchanced somatostatinergic tone. J Clin Endocrinil Metab. 2000 Mar;85(3);1310-5. 20. Roboz GJ, Interleukin-5 and the regulation of eosinophil production. Curr Opin Hematol. 1999 May;6(3);164-8. 21. Rojas Ramos E, The TH2 theory in allergy. Rev Alerg Mex. 1999 May;46(3);83-8. 22. Bischoff SC, Immunohistological assessment of intestinal eosinophil activation in patients with eosinophilic gastroenteritis and inflammatory bowel disease. Am J Gastroenterol. 1999 dEC;94(12);3521-9. 23. Robinson DS, Eosinophil development and bone marrow and tissue eosinophils in atopic asthma. Int Arch Allergy Immunol. 1999 Feb-Apr;118(2-4);98-100. 24. Macfarlane AJ, Basophils, eosinophils, and mast cells in atopic and nonatopic asthma and in late -phase allergic reactions in lung and skin. J Allergy Clin Immunol. 2000 Jan;105(1pt 1);99-107. 25. Yang X, IL-10 deficiency prevents IL-5 overproduction and eosinophilic inflammation in a murine model of asthma -like reaction. Eur J Immunol. 2000 Feb:30(2);382-391. 26. Linden M, Circulating eosinophil/basophil progenitors and mucosal cytokines in seasonal allergic rhinitis. Allergy. 1999 Mar;54(3);212-9. 27. Cameron L, Evidence for local eosinophil differentiation within allergic nasal mucosa: inhibition with soluble IL-5 receptor. J Immunol. 2000 Feb 1:164(3);1538-45. 28. Shi HZ, Effect of inhaled interleukin-5 on number and activity of eosinophils in circulation from asthmatics. Clin Immunol. 1999 May;91(2);163-9. 31. Baum WF, et al. Atopic skeletal retardation as a possible cause for short stature and thoracic deformity in children with asthma. Kinderaztl Prax. 1993 Oct;61(7-8);285-90. 32. Reed CE, Abnormal autonomic mechanisms in asthma. J Allergy Clin Immunol. 1974 Jan;53(1);34-41. 33. Kliesch WF, et al. Restoration of depressed immune function in spinal cord injury patients receiving rehabilitation therapy. 1996 Feb;34(2);82-90. ?